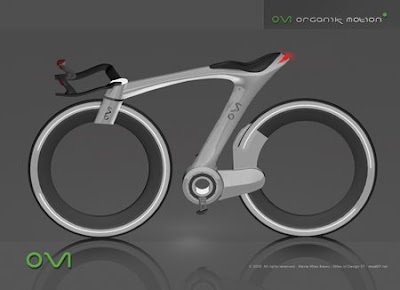 RANTWICK - Commuter Cycling in London Ontario | A Bike Blog: Concept Bikes: Notes From The FUTURE! I'm sure many of you have seen some really cool designer concept bikes before. In this post, I've gathered some that point to the future, revealing a great many things I hadn't ever imagined! I have included some of the features and descriptions of these mind-blowing machines, and will conclude with some observations about what these bikes have to tell us about the future. 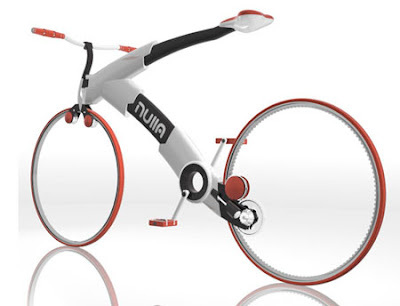 Nulla bike is a minimalist bike concept. Nulla is one way of saying “nothing” in Italian. Bradford Waugh named it that way for lack of central hubs or chain-drive, giving it a very minimal visual weight... This futuristic bicycle provides deep coverage, good appearance and comfort perfect for riding and skating. However, it is not sure whether you will have a safe riding with this kind of seat on a bicycle. It's just a guess, but I think that maybe something was literally lost in translation on this one. When open, ‘One’ is a comfortable stylish bicycle that not only offers all the benefits of cycling (like cheap travel and exercise) but with its revolutionary power assist system the user can cruise around with ease. When folded, ‘One’ turns into a smooth, light and compact case free of all dirty and protruding parts. ‘One’ can be easily carried, stowed and stored. Perhaps in the future more highly evolved humans will be as advanced as this folding bike, and finally be free of all dirty and protruding parts... who knows? I always thought folding bikes were kind of weird. This, however, has opened my eyes as wide as this bike's frame-holes! Wow! 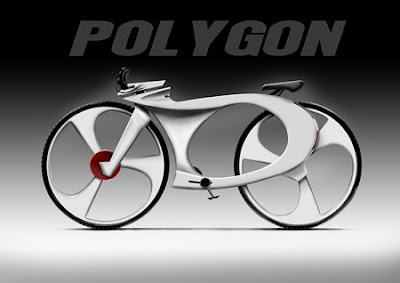 Check out this bike design for Polygon which is a combination of standard bike and music player. Today, everyone prefers music while driving, at the gym, at work, on the street or even in library. Music has become the lifestyle of today’s generation and therefore, this bike is designed with the rhythm of today’s lifestyle. There is a music player attached with the adjustable steering and it can turn the energy of the bike into power and automatically store it in the battery which can be later used for light at night and brake light. Style and amazing look is something that this bike surely offers. This is the most elaborate ipod carrying case I've ever seen! Listening to music while cycling in traffic won't be a bad idea in the future, since the "cars" will all be airborne anyway, and the safety force fields will take over if you don't hear something approaching. The future is gonna rock! Organik Motion Is based on a Z-frame concept. It features a fully integrated braking system, integrated front and rear suspension systems, an integrated shaft drive and a height adjustable saddle and handlebars. This comes along with a joystick-mounted gear and break lever system, which is integrated in the ergonomic handlebars. 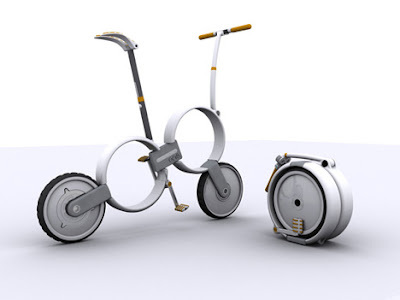 Additionally, the bicycle features a static inner wheel system with safety features such as integrated reflectors on the rotating outer wheels and a taillight, which is mounted in the bike’s frame. The future is SO INTEGRATED! I can't wait. The future of hubs, spokes and chains doesn't look too good; in fact my best guess is that they get banned for some reason. Although it may seem odd to my feeble brain, I have to trust that a more advanced human race will have good reason to stamp them out in favour of integrated direct drive systems and empty circles. To my present-day mind it seems that wheels would bend and drivetrains would be impossible to work on, which would be necessary to make them work at all; of course I'm stuck in my stupid reality that doesn't have much in the way of nano-bike-component-robot-drones. The future's hatred of visible moving parts kind of freaks me out - but I know that these machines will be so reliable that understanding how they work will be completely unnecessary, kind of like the political systems in use in most democratic countries today, or you know, laws and all that stuff. 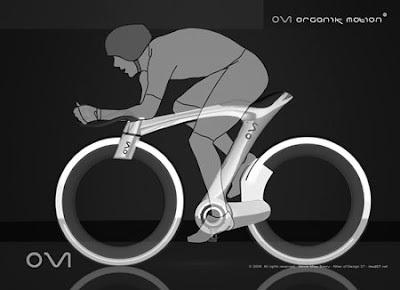 Please don't copy me, but I think I know where to invest my money, thanks to this vision of how bikes will be. Backpacks. I am going to research the hell out of backpack companies, because racks, panniers or baskets will be GONE in the future. Well OK, you can use this info too... but if you blab this all over and drive backpack company stock prices up, I swear, I won't be your friend any more. 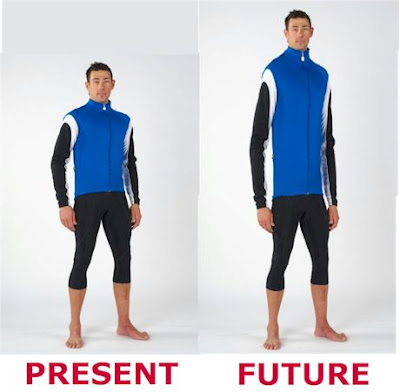 I learned not only about the future in my research, but also about the present, by looking at the comments on these designs. I had no idea that so many Engineers browse these designs, or how negative they are. Their "status quo" thinking prompts them to point out all the ways in which the designs couldn't work. These bikes are from the FUTURE! Show some vision, you Internet Engineers. I don't like that lack of vision, but I truly pity the commenters (and there is always at least one) who asks, "Are these available now?" Once again, these are the bikes of the FUTURE! PS - I'm not perfect. If any of you "Are These Available Now" people can find any of these bikes being produced and sold, please accept my apologies. Email me with the information, and I will GIVE you, with no strings attached, every last one of my backpack company shares as a gesture of good will.